Please help us find our dog. 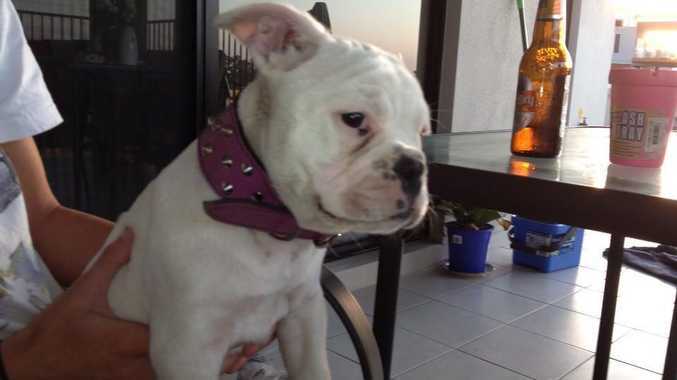 BABY is our White Aussie bulldog X, Female puppy, 6mths old went missing from our backyard in Vantage Estate, Kirkwood, Gladstone Monday night 10/12/12. We believe someone has stolen her and is keeping her for themselves this little girl is very special to us and is very loved and missed. Her name is Kaylee but she answers to baby. She has half a tail which is kinked and she is all white with black spots on her tummy. She is microchipped. This is heart breaking as she isn't just a pet to us but a child. We want her home for Xmas so she can open her presents with us. Please people keep an eye out for us as well. I will not give up looking for her so if you have her just please return her. She isn't a fashion accessory or a puppy maker, she is a beautiful baby who deserves to be with the people who love her. You wouldn't steal a human child so why steal the only baby we can have? Please return her. She is our everything.